Major storm no obstacle for Chabad’s Jewish outreach gathering. High winds, heavy rain and the prospect of snow were no obstacle to the Chabad-Lubavitch movement’s annual gathering of Jewish outreach workers. Five hundred Chabad emissaries (shlichim) met in Nir Etzion hotel on Tuesday despite the “Frankenstorm” lashing the country. Those at the meeting are usually spread from Metula to Eilat in Israel’s 294 Chabad House outreach centers. The annual meeting aims to give them encouragement for the year to come. 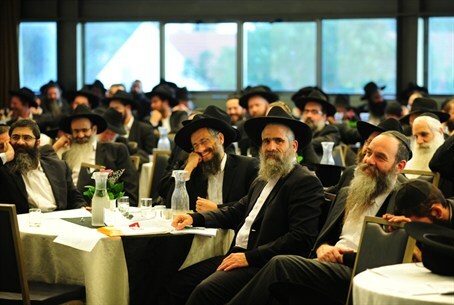 The conference included dozens of meetings and lectures on a variety of topics, with a focus on how to best continue Chabad’s work of assisting Jews in doing mitzvoth (commandments). Chabad is known for its focus on the individual mitzvah. The movement’s better-known campaigns focus on encouraging many people to do a single mitzvah, rather than on encouraging a smaller group to fully adopt a religious lifestyle.